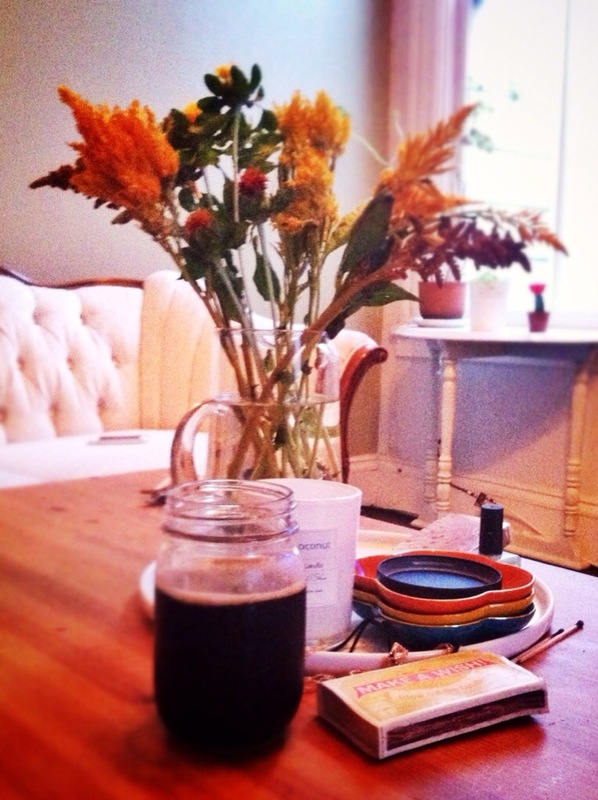 Before my roommate took off on a 4-month Southeast Asian adventure, we were in our San Francisco apartment on a typical lazy Sunday. With no particular plans other than avoiding a rainy San Francisco day and the gnawing feeling that we needed to clean, we decided to make the most by being as domestic as we could, and incorporating as much pumpkin into the day as humanly possible. This left us with a clean apartment and a lot of food to write about. It became the day of our second annual Stuffed Squash Project. This is where we decide to get fancy and with no recipe in particular, hollow out a squash of some sort, and stuff it with something delicious. For those of you who watch Portlandia, stuffing anything into a squash is the “put a bird on it” of San Francisco. It’s pretty much a guaranteed crowd-pleaser, but sometimes it can end up flavorless or tiring. I have to say, our first annual attempt ended up this way. We had some mushy quinoa with sparce toppings, and it was a noble, but anticlimactic end result. 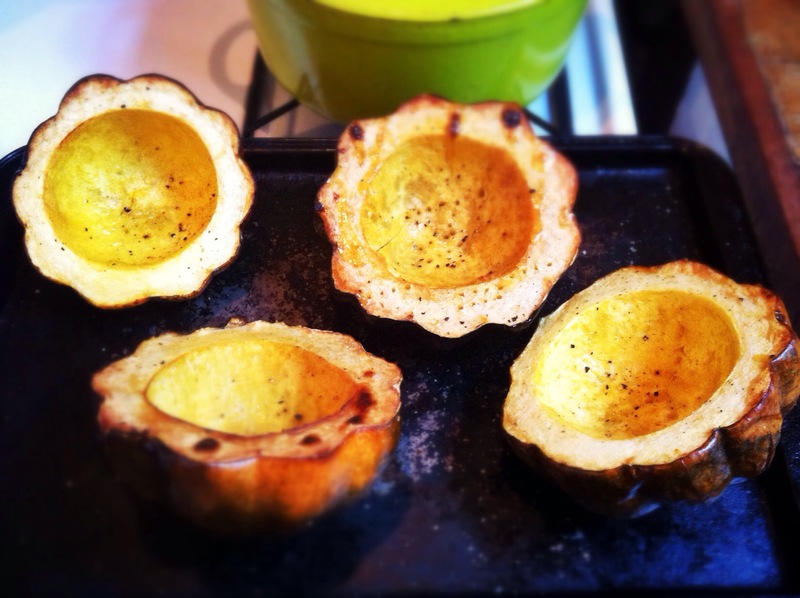 Most hollowed out squashes are pretty big, so you risk ending up with mostly dry, flavorless grains. This is no good. You need to stay entertained for the full squash. The goal is to have a completely satisfying meal in one edible bowl. So instead of going with a recipe, we decided to pick what we liked. We bought some acorn squash, and a handful of other yummy things – a wild rice medley, sautéed mushrooms and onions, kale, pecans, parsley, and feta cheese. This is my favorite combo I’ve had yet. The wild rice holds up well and keeps from getting mushy. Browning the mushrooms beforehand gives them a rich flavor and color. The kale adds a little heft and makes you feel healthy. The crunch of the pecans and plenty of salty feta keeps things interesting the whole way through. I recommend combining this with a hefty dark beer, the heat turned up, and an easy desert baking in the oven – we made pumpkin brownies from a Trader Joe’s mix (hey, not everything is a blog post). Happy holidays! Halve the acorn squash, hollow out, pierce with a fork, and rub with olive oil. Salt on the inside. 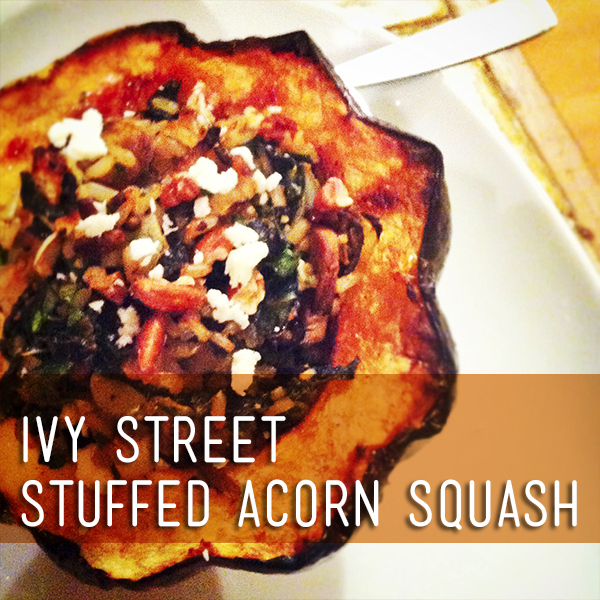 Heat the oven to about 400 degrees and roast the acorn squash until soft, about an hour to an hour and fifteen minutes. While the squash cooks, cook the rice according to package directions. In a pan, add olive oil and butter and brown the mushrooms, a la Julia Child (aka, don’t crowd the mushrooms or they don’t brown!). Transfer to a large bowl. Next, sautee onions in olive oil until soft and browning, about 10 minutes. Add in shredded kale and cook until soft, another 5-7 minutes. Add these to your bowl. Mix in chopped parsley, most of the pecans, most of the feta, and seasonings. 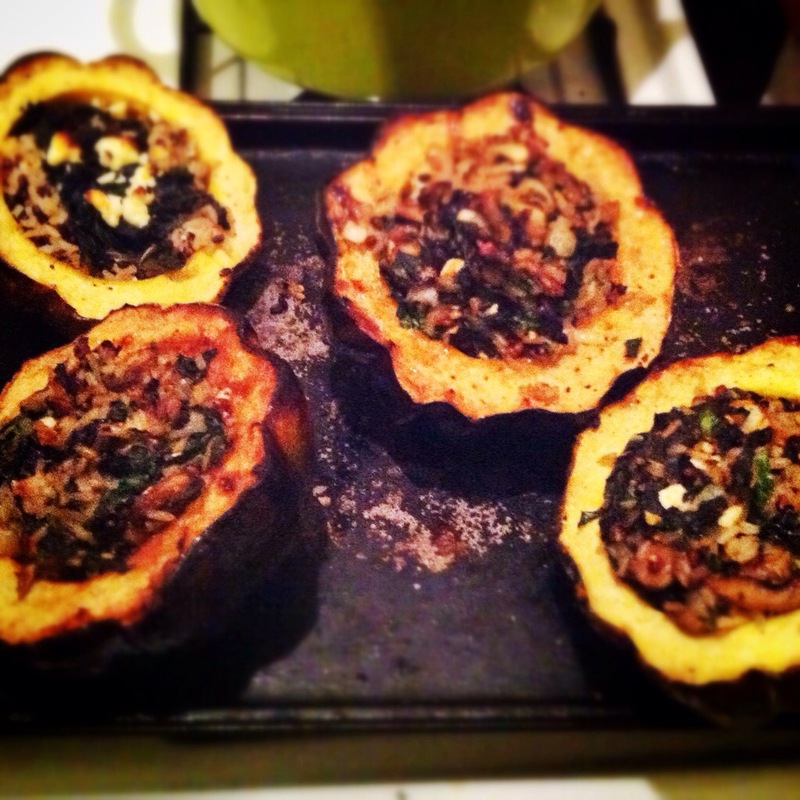 Combine thoroughly, and then stuff the acorn squash as full as you can. Bake together for another 15 minutes. Remove and garnish with more pecans and feta.